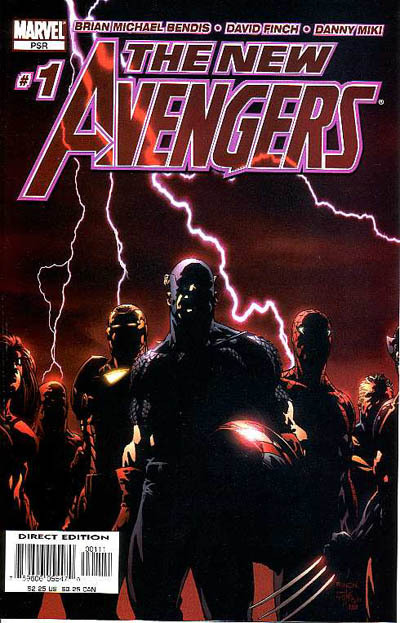 Brian Michael Bendis in 2004 took over the writing for the New Avengers title. 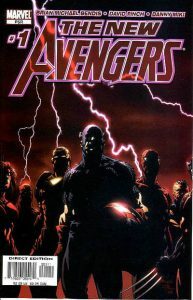 Avengers title had never been a top seller at Marvel till Bendis worked his magic and it soon became one of Marvel’s best-selling books. In November 2004 Marvel Comics Catalog said about the upcoming Issue: After the devastating destruction of the original Avenger’s just what sort of threat to the world could persuade Captain America to assemble an all-new team? And after the events of AVENGERS DISASSEMBLED, who could possibly be on this team? The answer to the biggest secret in comics is only found right here. Get ready for the first of a proposed 500-issue run that signals an all-new era, as Bendis & Finch join with you, the fervent faithful, for the launch of the all-new ongoing Avengers series! The New Avengers #1 – This story has Captain America (Steve Rogers), Luke Cage, Spider-Man (Peter Parker), Spider-Woman (Jessica Drew), Iron Man (Tony Stark), Daredevil (Matt Murdock). The primary villain is Electro (Maxwell Dillon). On the Raft, the Maximum-Maximum Security Installation of Riker’s Island Electro is causing trouble he materializes out of a piece of ball lightning, collects the person he was freeing, and to cover their escape, frees the remainder of the prisoners. As explosions rock the Raft, Murdock makes Jessica Drew take them to his client. Opening his cell, Murdock pleads to the untidy hermit for help. When asked, Murdock reveals that the man is the Sentry (Robert Reynolds), the most powerful meta-human on the planet, serving a voluntary sentence for killing his wife. The reintroduction of The Avengers as the New Avengers is full of action and human drama the comic reader can relate to. Superheroes with human problems which Captain America molds into the greatest Marvel group of superheroes ever. David Finch’s artworks for this book it’s darker and sets a tone different from the previous Avengers book. Despite whatever one’s feelings on Avengers Disassembled, this book should be treated as a separate entity. 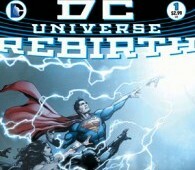 For a first issue, it has a strong set-up to what will be a strong story. Honestly, great story good dialog. The idea that Jessica Drew would be working as a security officer at the prison was also a clever way to place the character at the scene, and the last page that explains Sentry’s presence at the prison was also a surprise development. This opening issue does a solid job of bringing its cast together, as well as developing the threat that will force them to work together. What is good, and something that Bendis does well in every comic he writes, is how he begins to move each character into place, puts them where he wants them to be and makes them fit into his story. The good 1st issue with really nice art and fluid storytelling and great character work. Bendis is a very good storyteller and the reintroduction of the Sentry adds mystery to the writing and I like the fact that a loner like Spider-Man can be part of a team and work together with other heroes. The Avengers is a team of superheroes that appears in publications published by Marvel Comics. The team first appear in The Avengers #1 (Sept. 1963) and were created by writer-editor Stan Lee artist and co-plotter Jack Kirby. Labeled “Earth’s Mightiest Heroes”, the Avengers originally consisted of Ant-Man, Wasp, Thor, Iron Man, and The Hulk. Captain America joined in issue #4. The rotating roster has become a hallmark of the team, although one theme remains consistent: the Avengers fight the foes no single superhero can withstand — hence their battle cry, “Avengers Assemble!” The team has featured humans, mutants, robots, gods, aliens, supernatural beings, and even former villains. A short-lived team of superheroes in the 1950s called themselves the “Avengers”. Consisting of Marvel Boy, Venus, the 3-D Man, Gorilla-Man, the Human Robot, Jimmy Woo, Namora and Jann of the Jungle, the team exists in an alternate timeline that is erased by the time-manipulating Immortus. 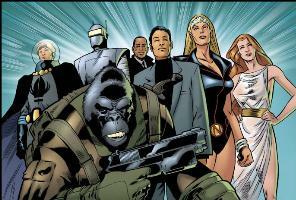 A version of the group without the 3-D Man and Jann exists in mainstream continuity, and eventually reforms in the present day as Agents of Atlas. It is composed of characters originally appearing in unrelated stories published in the 1950s by Marvel’s predecessor company, Atlas Comics. This group of heroes, which was not a team in 1950s comics, was established through retroactive continuity as having been established in the 1950s. They had appeared as a group in the non-canonical What If #9 (June 1978) and then reappeared in Avengers Forever (1998-2000 miniseries).